The mission statement of the RareNoise label is “to detect and amplify contemporary trends in progressive music.” Since 2008 it has been prolific in the production of confrontational records with a bias toward electronics, groove, and the jumbling of genres. Jamie Saft looms large on the label. 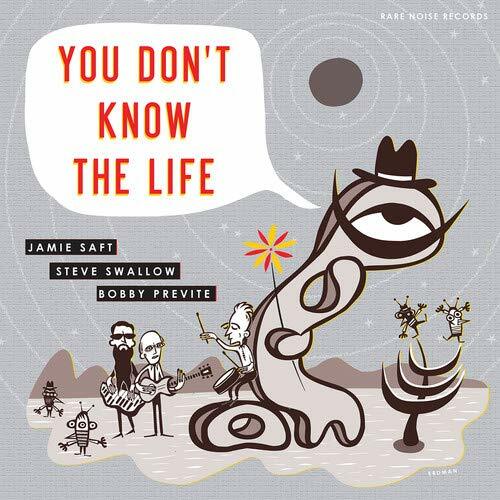 You Don’t Know the Life is Saft’s 18th RareNoise release. It is billed as a project that “redefines the organ trio.” That is a large claim, but in this case defensible. The album opens with the least ethereal version of “Re: Person I Knew” ever recorded. Electric bassist Steve Swallow and drummer Bobby Previte turn Bill Evans’ meditative masterwork into sinuous funk, while Saft rasps the melody in the unfamiliar abrasive sonorities of the Baldwin electric harpsichord. Most organ trios have a guitarist instead of a bassist. Swallow’s fluid, lyrical lines are center stage in this trio and are one reason it sounds different. Another factor is that Saft supplements his B-3 with unusual keyboards like the Whitehall organ and that electric harpsichord. Deeper reasons are freedom and irreverence. While this ensemble participates in the longstanding tradition of the organ trio as an engine of gut-level soul, it undermines the groove (on pieces like the title track and “Stable Manifold”) through complexity and abstraction. The episodic free associations of “The Cloak” are outside the purview of the organ trio as we have known it. Special players get personal, varied sounds from their instruments, even Hammond B-3s. On “The Break of the Flat Land,” Saft’s delicate tracings are as pretty as any guitar. But “Moonlight in Vermont” is thick and lush with powerful organ sustains. The album ends with “Alfie.” Saft is beautifully respectful of the yearning theme, while Swallow threads questioning countermelodies all through it and Previte is snaky and drops occasional bombs. Preview, buy or download You Don’t Know The Life on Amazon!